Michelle Feynman, whose father was Richard Feynman (1918-1988), laureate of Nobel Prize for physics, and one of the participants in the atom bomb project, came to Tuva on June 8. 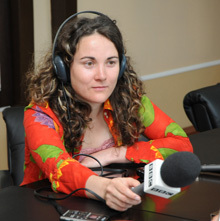 She is accompanied by Ilona Vinogradova, a BBC correspondent. This visit is expected to result in a radio program about the dream of the scientist – to visit the republic in the center of Asia, which Feynman had been trying to visit for almost 20 years. Feynman and his friend, mathematics teacher Ralph Leighton, who were both passionate admirers of Tva, bombarded Intourist and The Academy of Sciences with petitions; they sent letters to Tuvan addresses found in ecyclopedias; they wrote messages with the help of a Tuvan-Mongolian-Russian phrase book and a Russian-English dictionary; they attacked Moscow radio, which broadcast in English, with a single plea: “Help us get to Tuva.”. They received formal responses, but without an answer to their main question. The two friends founded the organization “Friends of Tuva in America”, they observed Tuvan national holidays, and performed virtual travels through the streets of Kyzyl or Chadan. Feynman never managed to get to Tuva. He died in 1988. Instead of him, the trip was realized by his daughter Michelle. During this visit, Michelle Feynman met with throat singers, and with relatives of the famous folklorist Ondar Kishchalaevich Darymaa (he became the first Tuvan whom the two friends contacted, when they found his address in a scientific publication after a long search in various libraries). On June 10, Michelle Feynman met with the head of the republic, Sholban Kara-ool. During the BBC interview, the Tuvan Premier answered questions on the subject of why Tuva is so attractive to hundreds of foreigners, and how to utilize the energy and potential of the people, who are “obsessed” with Tuva like Feynman, for the good of the republic and for its development. All the adventures that the two American fans of Tuva met during their desperate attempts to visit the center of Asia are described in Ralph Leighton’s book “Tuva or Bust”. This is the first chapter of that famous book. The plates were being cleared from the table, and I had just begun finishing off the salad – part of what had become a weekly ritual at the Feynmans’. Richard, always at the north end of the grand table, traded witticisms with his son Carl, who shared the lengthy east side of the table with the guest. To the south sat Gweneth, making sure the food moved smoothly around the table, and daughter Michelle occupied the west. It was late summer of 1977. Michelle was about to enter the second grade at a local elementary school; Carl was ready to begin his junior year at the high school in Pasadena where I would be teaching mathematics and coaching water polo. “Or Nigeria, Niger, or Nicaragua,” said Carl, with a hint of his mother’s Yorkshire accent. “So you think you know every country in the world?” interjected Richard in a familiar, mischievous voice, that usually signaled impending doom for its target. “Uh, sure,” I said, taking another bite of salad, preparing myself for the embarrassment that was sure to follow. I grabbed my last bite of salad as we got up from the table and proceeded into the living room to Richard’s favorite book, the Encyclopaedia Britannica. In the last volume there was an atlas. We opened it to a map of Asia. Sure enough, occupying a notch northwest of Mongolia was a territory that could well once have had the name Tannu Tuva. I thought, I’ve been had by a stamp collector again! “We must go there,” said Gweneth. Everyone returned to the dining room for tea and dessert. We discussed how we might reach our goal. Of course Richard could give a series of physics lectures in Moscow, and we could all go to Kyzyl afterwards. (Actually, anyone traveling under such circumstances should insist on going to Tuva first, in case some sort of “difficulty” arose after the lectures.) But reaching tuva that way would be like riding in a helicopter to the summit. Richard had journeyed to remote corners of the world before. Gweneth recounted how, a few years before, they had trekked for two weeks on foot with a friend and a Mexican graduate student into a mountainous region of northwest Mexico. They descended into a canyon, the Barranca de Cobre – said to be longer and deeper that the Grand Canyon – and met Tarahumara Indians who had had very little contact with the outside world. Ricgard had borrowed a Tarahumara-Spanish dictionary from UCLA and learned some phrases from it, but when he spoke to them in their native language, the Indians suspected he was a Mexican government official! After convincing them otherwise, Richard was offered the local intoxicating brew by the Tarahumara as a gesture of honor. (Richard normally did not touch alcohol, but made an exception in this case.) Gweneth and Richard enjoyed the adventure so much that they returned to the region a year later. After dinner Richard and I continued the weekly ritual, going downstairs to drum in his studio. Although we had been drumming together for ten years by now, that “primitive” activity still had not lost any of its power. During one of our breaks Richard went to the book case, which was filled to the brim with books, technical papers, exotic rhythm instruments, and artist’s sketch pads. Soon he pulled out an old, slim book and opened it. It was an atlas from 1943. And there, on the map of Asia, next to Outer Mongolia, was that purple splotch called Tannu Tuva.